Dr. Holly Wojciechowski received her undergraduate degree at Virginia Polytechnic Institute with a major in Biological Sciences and minors in Classical Studies and Latin. She received an honors diploma in part for her undergraduate research thesis concerning the innate immune response of house finches during disease progression. She attended veterinary school at the University of Tennessee College of Veterinary Medicine. While there, she was president of the Feline Club and played an active role in planning the annual symposium of the Avian, Wildlife, and Exotics Club. 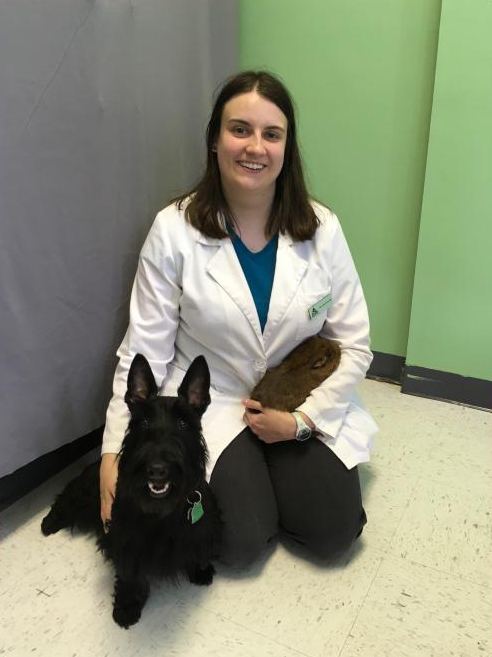 She enjoys working with all species of companion animals and loves the variety of small and exotic animal veterinary practice. She has a particular interest in the medicine and surgery of avian and exotic pets. She also enjoys surgery and cytology. Recently, she presented a poster at the annual conference of the American Association of Zoo Veterinarians concerning osteoarthritis in lions. Her current pets include a guinea pig named Hector, a chinchilla named Sosuke, and a Scottish Terrier named Murphy. Prior to joining the team at Midway Veterinary Hospital, she was an associate veterinarian at another small animal private practice. In addition to veterinary medicine, her interests include choral music, art, reading, being outdoors, and traveling.